It looks like IAF has ordered 36 more MKIs. Delivery will start from 2019. This is separate from the order of 272. Over the next 10 years, we must have 200-250 aircraft. It has to be balanced out. In the heavy weight spect rum, we have enough. But in the medium weight category, we need to have more. Yes, about 200 will be very good,” the Air Chief said, adding that the Light Combat Aircraft with enhanced capabilities will be operated in large numbers soon. The officer said that while the sanctioned strength of fighter aircraft by the government is 42 squadrons, the air force is keen on a capability mix that will consist of more medium category combat aircraft. Virtually ruling out more orders for the heavy air dominance Su 30 MKI fighter, Air Chief Raha said that enough numbers were in service that will last for another 30-40 years. ...At the moment, besides the two squadrons of French Rafale combat jets (36), IAF is also ordering two squadrons of Su-30 MKIs (to take their number to the total 272 ordered). Reduced numbers place a severe handicap, akin to a cricket team playing with seven players instead of 11. Though we are operating under challenging conditions, we have devised mitigating strategies. The government has signed an intergovernmental agreement for procurement of 36 Rafale aircraft in direct flyaway condition. Further, inductions of the remaining Su-30 MKI aircraft and Light Combat Aircraft are in progress… When the planned inductions of the Single Engine Fighter under the strategic partner fructify, IAF will attain its authorised strength of 42 squadrons, which is expected by the end of the 15th Plan Period and which we feel is the minimum strength necessary to “dominate” a two-front conflict. He said "We have to only produce about 35 Sukhoi-30 aeroplanes, that's in the next three years and then there is nothing else left for us unless we start booking orders." Stating that HAL is eagerly looking for 83 LCAs which has been cleared, Rajus said "otherwise there is no fixed wing aircraft production in the next five years to come. There are no new orders, but the order of 42 that was added to HALs production line, out of which 2 squads are left in production now and planned for induction into service from 2019 onwards. IAF has the power over all shore based maritime attack fighters, be it Jaguar IM with Harpoon, the upgraded Mig 29 with Kh35, or the upgraded MKI with Brahmos and most likely Kh35 too. Not to mention that maritime attack role, was envisioned for MMRCAs as well, so IAF is not giving away coastal defence for sure. Silly imo, but it is at it is. The truth is a bit different. Foes have become friends for their love for Rafale. Do you know in Goa we have a lovers point named after two naval aviators who went up for a mock air combat to decide who will own the girl they both loved? The fight ended in mid air collision. One of them died, other managed to bring his aircraft. The point where this aircraft fell is called lovers point by IN in Goa. The girl married another man. Love and Hate are two emotions which can completely wreck a person and put him on path of self destruction. zebra7, Golden_Rule, Shekhar Singh and 2 others like this. Until something is signed, nothing is concrete. Unless they have decided not to make it public. IAF is also ordering two squadrons of Su-30 MKIs (to take their number to the total 272 ordered). That bit in the brackets seems to be the writer's assumption. Not the actual quote by Dhanoa himself. IAF has no need to "order" any squadron out of the 272, the remaining 35 jets from the 272 were ordered back in 2000, so there is no need to "order" it again. So he is obviously talking about a fresh set of orders. And from Raju's quote, it seems that the IAF is bypassing the HAL. The last 35 of the 272 will be delivered from this year onwards and production is set to end just after 2020 starts. So the new order for 36 (delivery to begin from 2019) and the order for 272 (last 35 to be delivered from this year) are different. Unless you understand things first, you always will spread misinformation's and in this case, that he is talking about the remaining MKIs. So the new order for 36 (delivery to begin from 2019) and the order for 272 (last 35 to be delivered from this year) are different. X_Killer and Zer0reZ like this. Another video of brahmos air launch. This is a story from the summer of 1996. Some of you might remember (and the rest can Google) how a little controversy had started to build in the last days of the Narasimha Rao government when, with the election campaign in full swing, the Sukhoi-30 deal was signed with the Russians and, The Indian Express broke the story. There were immediate protests from the BJP. Rao’s was after all a caretaker government with the Election Commission’s model code in force. There were dark insinuations, as it is usual with all defence deals: was Rao in a hurry to collect hundreds of crores for his campaign? Then, surprisingly, the BJP stepped back. Because the facts were absolutely to the contrary. Somebody did indeed want money from the Sukhoi deal, but it wasn’t Rao. Two weeks before the first round of the 1996 elections, I got a call one morning from Jaswant Singh to talk about the Sukhoi story. What did I think about the deal, he asked. Did I suspect there was a scam, like Bofors? I told him I had heard no such thing and that my friends in the IAF thought this was a great aircraft. He then asked me if I would see Mr Vajpayee (then leader of the opposition) to talk more about this. The same afternoon, I got a call from Vajpayee’s home to see him at breakfast the next morning. Vajpayee was lovingly and generously buttering a crisp toast and feeding it in small pieces to his favourite Pomeranian, while exploring the possibility of a campaign-time bonanza of a scandal bigger than Bofors. His question, briefly, was as follows. The lame-duck Congress government had sealed the deal in its last days in an unseemly hurry. It was also his ‘information’ that the government had paid an advance of around $350 million to the Russians without any final price settlement. Why such an unusual rush? Did the Congress want to collect a kickback in the last, cash-and-carry phase of its government? He said he had heard that the Express knew more about this, or if not, could I have it looked at more closely? He said his apprehension was that “if it is a good plane, unsubstantiated talk of a scam should not scuttle the deal”. At the same time, knowing the ways of the Rao government, and circumstantial evidence in the case, you naturally suspected a kickback. We checked out our usual sources and suspects and it did not seem that the decision, though hasty, was mala fide. The BJP too kept quiet, Rao’s Congress was defeated anyway, and Vajpayee’s coalition government was sworn in, although the first time it lasted only 13 days. It was towards the last couple of days of that government that Jaswant Singh called me to chat on the sidelines of a public function. “That Sukhoi story,” he said, “is actually nothing.” Having been in government now, they had been able to look at the files and it was a clean deal and the haste, if any, was in a larger national interest, so it would be better to forget all about it. He wouldn’t tell me what that ‘larger’ national interest was. The scene now shifts to the IAF mess on New Delhi’s Zakir Hussain Marg, a few months later, and we pick up the thread of that Sukhoi story again. Now H.D. Deve Gowda’s coalition was in power and Mulayam Singh Yadav was the defence minister. His ministry had organised a dinner for him to meet senior editors at the IAF’s showpiece mess in Delhi. Mulayam’s defence ministry had just finalised the full Sukhoi order. I stole a discreet moment to ask him if he had looked at the Sukhoi deal closely, because it was signed by Rao in such haste, there was a large, arbitrary advance involved, and because the top leaders of the BJP were at one stage suspicious about it. “I know, I know, Jaswantji and Atalji had brought this up with me,” he said. Then he went on to describe in detail how, before the final, full deal was signed, he had actually invited Vajpayee and Jaswant to South Block to have a detailed presentation on the deal given to them. He said they had suggested changes in the deal documentation, including the provision of a sovereign guarantee from the Russian government that no kickbacks were paid and, should any be discovered any time in future, they would reimburse the amount to the Government of India. We had failed, alright, to break a marvellous story, of how arch-rivals Mulayam and the BJP had actually exchanged notes on such a sensitive issue behind closed doors. Though late, it was still a great story, I thought, and so asked the redoubtable Ritu Sarin, the head of the Express investigative bureau, to find out more. Sure enough, she landed up at Jaswant Singh’s office to check. At which point I once again got an invitation to Vajpayee’s house. This time, the point was simple. Could the Express avoid this story please? Because if it was published, it might hamper “our ability to communicate across party lines even on issues of such sensitivity and national interest”. These are days of bitter, ideological politics, but governing India is serious business, he said, or something to that effect. Now, the mystery of what exactly that ‘larger’ national interest was that had led to such haste and a large advance payment in the last days of the Rao government. It seems that Boris Yeltsin had told Rao that he too was heading for elections, that the Sukhoi factory happened to be in his constituency, was too broke to pay salaries to its staff and if India could pay it that advance, salaries would be paid. It would work like magic in his election campaign. That advance was, therefore, a political deal between the big boys, to be adjusted in the final pricing later. It was a conscious, diplomatic decision, cleared by Rao, and executed by none else than the then finance minister, Manmohan Singh. Rao took an incredibly bold decision (given the Bofors background) which the BJP, locked in a bitter electoral battle with him, was suspicious of, but did not make an issue of, in the national interest. When the BJP found the real reason (the Yeltsin request) they kept quiet — they in fact said Rao’s government had handled it masterfully. Then Mulayam Singh, whose entire politics is based on anti-BJPism, was large-hearted enough to open the files to its leaders and take their advice, again in the national interest. In one story, therefore, you had the top leadership of all three major political groups — bitter enemies — involved. Yet they talked, shared confidences, and did the right thing by their nation. Now compare that with the lack of communication, even social graces, the general antagonism in our politics through this past month, and you know why that Sukhoi story is so relevant, and worthy of recall. lca-fan, surya kiran, Zer0reZ and 7 others like this. _Anonymous_, Zer0reZ, Sancho and 1 other person like this. All the bilateral trade agreements during the period 1953-58 were almost like convertible currency agreements, payments relating to commercial and non-commercial transactions were to be made in rupee or pound sterling. In the same year 1957, the Soviet Union applied its first veto on a resolution on Kashmir in the Security Council sponsored by UK. The Soviet Union on February 20 vetoed in the Security Council the four-Power resolution on Kashmir proposing that India and Pakistan to discuss the question of demilitarisation of Kashmir and suggesting that the Pakistani proposal of sending a temporary UN force to Kashmir be examined. Mr. Arkady Sobolev, the Russian delegate, declared that the new resolution was only a repetition of the previous one which was unacceptable to India and he would be obliged to vote against it. Mr. V.K. Krishna Menon, India's representative told the Council that India would regard an attack on Kashmir as an attack on India and would take action accordingly. Reiterating that Kashmir was an integral part of India against which aggression had taken place, he said, "It is our duty, under the Charter, to resist the invasion if our territory is invaded, and I am directed to repeat that any invasion of any part of India is an invasion of the whole country." He said the four-Power resolution would not be a conciliatory act. It would be a step worsening the situation. "We are prepared at all times to seek conciliation methods. But no invader, whether in the Middle East, central Europe or Kashmir could be permitted to reap the fruits of aggression. Our position on Kashmir will stand the test of morality. We stopped our victorious army from going to Pakistan frontiers in the hope of settling the question by conciliation. In 1990,Moscow lacked in rupee funds to pay for its purchases from India. India had to finance the USSR by granting it a technical credit of 1800 crore, The Soviet Union preferred to sell their oil for hard currency rather than supply it to India for rupee payment. The test firing announced by India’s Ministry of Defence comes almost 17 months after the air force first flew with Brahmos on board the Sukhoi Su-30MKI in a captive carry test. India’s military has already fielded the Brahmos – the product of an Indian-Russian joint venture – in ship-launch and surface-to-surface modes, but the missile required several modifications for the air-launched version. The Indian air force completed software modifications to the Su-30MKI and Hindustan Aeronautics made the required electrical and mechanical changes to the aircraft. The most difficult modification was optimising the transfer alignment of the inertial sensors, the MOD says. That refers to the tricky process of calibrating the missile’s inertial sensors using data from the aircraft’s guidance systems. After completing the test firing in the Bay of Bengal, the Indian military claims the Brahmos is now the fastest anti-ship missile ever launched from the air. “The capability of the missile coupled with the superlative performance of the Su-30 aircraft gives the IAF a strategic reach and allows it to dominate the ocean and the battle fields,” the MOD says. The 2.5t missile is capable of striking any surface or land target from a standoff range of more than 400km and in any weather, India’s MOD says. The all-weather capability implies a radar seeker for terminal guidance. A Sukhoi-30 MKI aircraft of the Indian Air Force successfully test-launched the BrahMossupersonic cruise missile’s air-launched version on Wednesday. The missile was tested over the Balasore test-firing range against a sea-based target in the Bay of Bengal. With this test, India has commenced the drive to complete its tactical triad of the sea, air and ground-launched cruise missiles. The air-launched BrahMos will be tested for another year in a series of tests and inducted in the year 2019. After Nirbhay subsonic cruise missile’s launch this month, this test was the second successful test-launch. The importance of these successful tests in terms of the range, speed and impact of India’s deterrence is enormous. 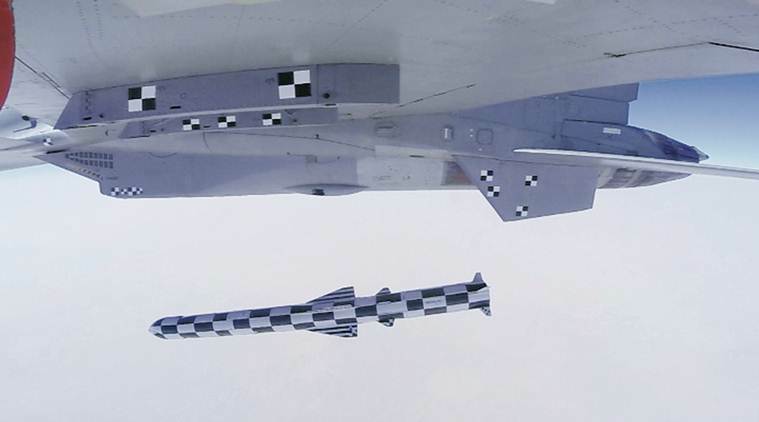 In the last few decades, a stand-off precision-strike weapon has become crucial to warfighting. Globally, the number, detection range and capability of air-search radars and fire-control radars of surface-to-air missiles have grown exponentially. The air-defence cover of major powers has become too dense to pierce, even for stealth fighters. In addition, airborne warning and control assets, over the horizon radars (OTHR) and satellite-based monitoring have brought a decisive shift in the air warfare methods. Accordingly, stand-off weapons, unmanned combat vehicles and lasers are emerging as crucial weapons of the future. With a 1200-1500 kilometre combat range of Sukhoi-30MKI aircraft, the BrahMos can hit any target within the range of 1500-1800 kilometres around India. In addition, BrahMos’ range is being extended to 600-900 kilometres, after India joined the Missile Technology Control Regime (MTCR) in 2016. A BrahMos-ER (extended range) was finally tested in March 2017 to a range of over 400 kilometres and the 900 km one is due for testing by 2019. Moreover, the hypersonic BrahMos-2 is another version under development. As a result of these developments, Indian capability for stand-off precision war is substantially expanding. BrahMos and Nirbhay may emerge as India’s carrier-killer missiles in the naval domain. A couple of squadrons of BrahMos-equipped Sukhoi-30MKIs, deployed each in the Andaman and Nicobar Command and the Indian west coast, will help to ensure a peaceful Indian Ocean. In addition, the threat of saturation strikes of these air-launched cruise missiles will neutralise naval ambitions of any Indian adversary in the region. Regionally, BrahMos has an important place in the Chinese discourse over India’s missile capabilities. Chinese media has been regularly highlighting its supersonic performance characteristics, penetration ability, anti-interference features and resistance to anti-missile interception capability. It is also argued in China that if BrahMos is equipped with nuclear warheads then India’s capability for air-launch of nuclear weapons will increase considerably. A United States report, which argued that a total of 64 BrahMos missiles could destroy a carrier battle group, has experienced frequent mention in the Chinese discourse. Therefore, Chinese defence experts recommend that China counter India’s tactical missile capability augmentation in three ways. First, they argue that core components and intellectual property rights of this missile are still in Russian hands. Moreover, most of cutting edge weapon platforms of Indian Armed Forces have some Russian role. Therefore, if China increases its proximity with Russia, with strong linkages, it can prevent or restrict Indian access to Russia’s cutting-edge weapons. If the Russian bear gets a large jar of Chinese honey and assurances of future refills, the Russian option can be minimised. Second, even though India can extend the range of the BrahMos missile to 600-900 kilometres, a crucial component to ensure a successful hit is the long-range precision-guidance capability. Chinese experts argue that Indian capabilities in airborne-early detection and warning systems, mid-course guidance systems and long-range radar coverage are limited. The satellite-based guidance system also suffers from faulty atomic clocks and a limited number of satellites. Hence, as long as these capabilities do not improve, the threat of this missile will remain local. Third, in terms of ground war, most of the Indian airbases are close to the India-Tibetan border. Therefore, China will be able to damage Indian air capability far more than India can with its limited range BrahMos. Indian BrahMos attack will certainly invite a Chinese response with CJ-10 long-range cruise missile which can even reach Delhi. Additionally, the mountainous terrain and dense coverage of HQ-9, HQ16A and other close-range air defence missiles will help neutralise the BrahMos threat for China. In the naval domain, China believes that any combat will be a system based operation. Therefore, a combination of YJ-12 anti-ship supersonic cruise missile (KH-31 missile’s Chinese version), HQ-9, HHQ-16, FL-3000 and CIWS guns will be used for China’s fleet defence. Moreover, the advantage in detection capability and the defensive radius of the Chinese Navy will be crucial. Another strategy would be to either detect its heat signature or strive to destroy the launcher before the missile is launched. Even a cursory study of the reports in the neighbourhood over the BrahMos missile reflects the unease, apprehension and a grudging acceptance of India’s advantage in a no-contact war. An extended-range, air-launched BrahMos with a capability to hit any target to nearly 2,000 kilometres would usher in a paradigmatic shift in the India-Pacific’s security architecture. However, India would need to increase the number of delivery platforms, as only 36 or 50 modified Sukhois will not be enough. The enhancement of long-range guidance capability is another major area that needs attention. The continued augmentation of tactical cruise missile triad makes India’s adversaries uncomfortable. India should do it more. DAC O DAC likes this.